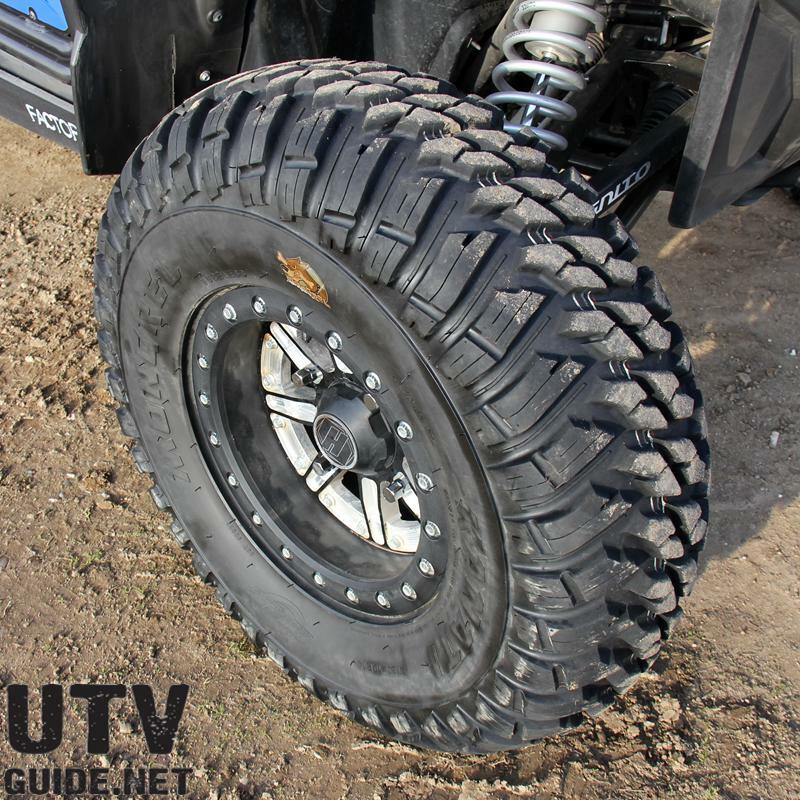 Amongst all the cool UTV builds and new products at the 2012 Sand Sports Super Show I found four different tire manufacturers with five new 30x10R14 tires. 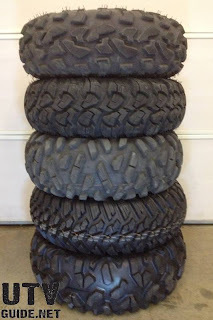 Being a fan of larger tires for rock crawling, I was thrilled to see manufacturers push in this direction. Until now if you wanted to run a large tire, the best option was to us a light truck tire on a 15-inch wheel. For pure rock crawling, I found the light truck tires worked just fine. I have run a set of 30×9.50R15 BFG KM2s and also a set of 31×11.50R15 Pit Bull Growler LTs on several different vehicles. On the plus side, the tires are tough. The BFG KM2 has a max load rating of nearly 2,000 lbs each and the extra ground clearance made rock crawling so much easier. In the desert it is a different story. 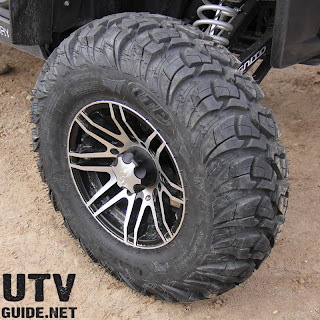 Although several Best in the Desert UTV race teams have been running light truck tires in the last few years, I tried them and was not happy with the outcome. The combined tire and wheel weight was right about 60 lbs (42 lbs. for the tire alone). The additional rotating mass really affected power, and the stiff sidewall and extra weight really took a toll on suspension performance. I could possibly let this go in order to get more ground clearance, the one thing I did not like was the lack of traction when cornering. 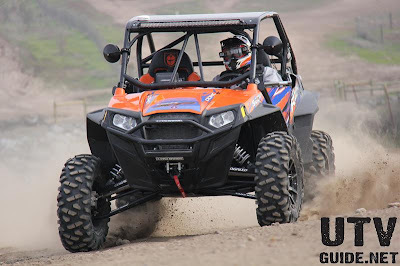 With most UTV tires it is pretty easy to slide in the corners. Predictability is key for me and I found that the BFGs would break free unexpectedly. This was a tire killer for me. 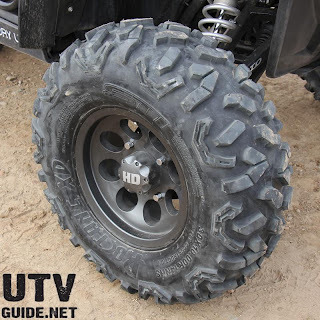 The new tires I found at the Sand Sports Super Show are specifically made for UTVs. 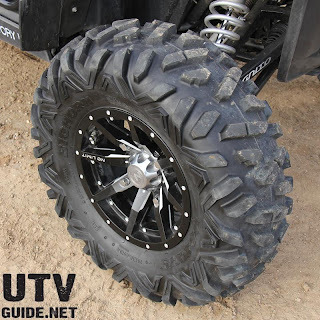 They all use a common 14-inch wheel, weigh less and have a max load rating much more inline with a UTV than a truck. After contacting the tire manufacturers about doing a tire shootout, all were interested in participating. It took a few months to gather all the sets, but in early December we were ready. To be most fair, we should have used the same wheel for each tire, but that would have proved cost-prohibitive for me. Take that into account. The first thing we did was weigh and measure each tire. We tested all five of the new 30x10R14 tires in a variety of terrain to see how they reacted in different environments. 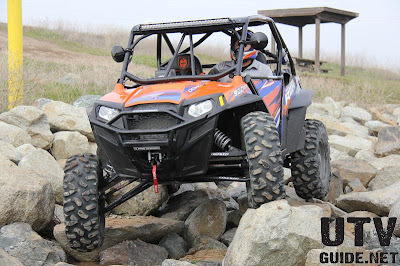 Our 2013 Polaris RZR XP was used for all testing. For the desert part of the test, I traveled to Barstow, CA and met up with Rick “Wally” Wallace from Side x Side Outfitterz and Mike Lasher from SxSPerformance.com. Both these guys are extremely experienced with desert terrain whether it be in a race or just for fun. After running all the tires through a course that included high speed dirt, g-outs, whoops and sand washes, we all agreed on our favorites. Tire pressure was set to 12 psi for all tires. For the short course and rock crawling tests, I hooked up with Paul Hart and used Prairie City SVRA as our testing grounds. This location is used by Valley Off-Road Racing Association for several short-course races each year, and also used by Nor-Cal Rock Racing for three events each summer. It is a great location for testing in these terrains. Tire pressure was set to 9 psi for all tires. After combining all the data from the different terrains, I worked with Wally, Mike and Paul to come up with our thoughts for overall performance covering all of the terrain we tested. Everyone agreed that the Bighorn is a great tire that we are all comfortable with. “Feels like home” was one comment that pretty much sums it up. The Bighorn is the only 6 ply tire that was tested so there was some anxiety about durability in race conditions. But the Bighorn had the most sidewall flex so this made for a plushest ride and provided for great traction. It is the lightest and also shortest of the tires so that helped with performance in the desert and short course. It was tied with the Roctane for widest tire at 10 inches. Would like to see a more narrow tire on the front axle. 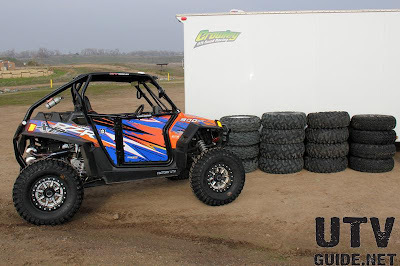 The Kanati Mongrel by GBC Motorsports is the first true all-purpose DOT tire built specifically for Side-by-Side UTVs. You might recognize the name Kanati from our affiliated light truck tire, the Kanati Mud Hog. 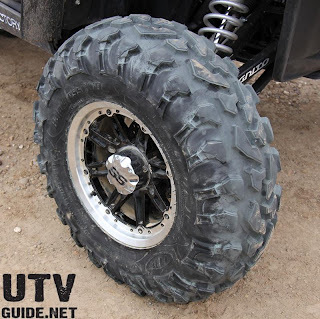 That’s because the Mongrel utilizes the very same tread pattern as the Kanati Mud Hog, marked by aggressive diamond-shaped lugs.Much like the light truck version, the Kanati Mongrel’s tread is optimized for peak performance on multiple surfaces. The Mongrel can handle a variety of off-road terrain while remaining equally safe and suitable for paved surfaces. The 8-ply, DOT approved radial also boasts an impressive 1,000 lb. load rating and an equally impressive 87 MPH “N” speed rating. The Kanati Mongrel was the top pick for desert, second in the rocks and short course and combined for the overall top position. The Mongrel is truly an all-purpose tire that stresses versatility and functionality. It is the lightest (just barely) of the 8-ply tires and also the tire that come closest to 30-inch tall. In general all testers felt the Mongrel’s height and width was the most proportional of all tires. The Mongrel is a great looking tire with a rounded profile, good siping and the best rim guard. The Mongrel is the only DOT approved 30-inch tire that we tested. When sliding around corners on the hard pack, we did notice that the Mongrel did not have as predictable of a kick out as the Bighorn or Roctane, but it was still tolerable. The Baja Cross is our second favorite overall tire. It did well in all terrain and has a proven track record for durability. This is the only directional tire of the five and this can be a slight issue with a spare tire mounted in the wrong direction. Although we did run them wrong in one instance and did not notice a difference. The tread pattern fared well in loose sand and is a predictable in the desert and short course. The 29 1/4″ height was on the shorter side of the tested tires and hurt its performance in the rocks a little. 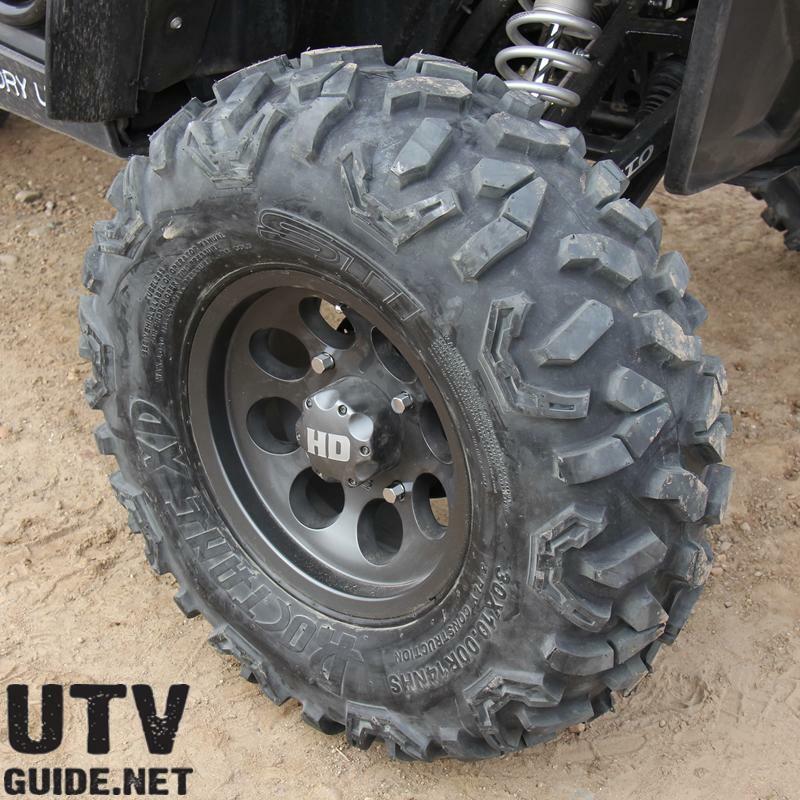 Although the Ultra Cross looks like an all-terrain LT tire, it is not DOT approved. The Ultra Cross is very similar in shape and size to the Baja Cross and has good curb appeal. The tightly spaced tread pattern should make it less prone to damage from sharp rocks or nails that can puncture a tire with a more open tread pattern. We all felt like the Ultra Cross had less traction that affected cornering in the desert and short course. 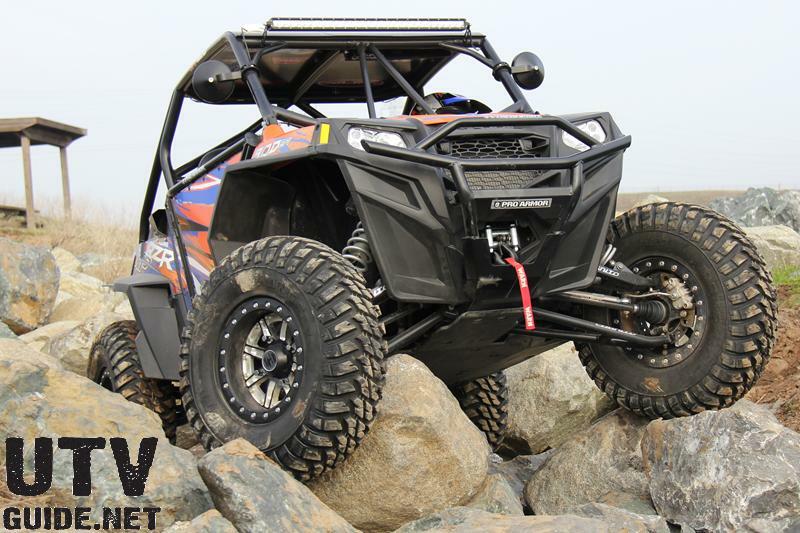 Roctane XD’s 8-ply-rated radial carcass is built to confidently handle ever larger, faster and heavier UTV applications. A heavier denier nylon cord maximizes tire toughness while retaining flexibility for a comfortable ride. The Roctane’s unique, non-directional tread design and wide profile footprint deliver smooth, quiet operation and precise control. STI’s exclusive new RocWall sidewall construction features reinforced lower sidewalls and extra-wide tread belts for added shoulder protection and stability. Add in super-deep RocGuard rim guards to protect even the thickest wheel lips from trail damage, and the result is the most reliable tire on the market. The Roctane XD’s specially formulated tread compound extends it life even further, yet it still grips the slickest rocks like a dedicated wall-crawler. The Roctane XD was clearly the biggest tire of five. At 39 lbs., 31″ tall and 10″ wide it topped all categories. This is a stout tire with a stiff sidewall. The larger size and solid traction made it the favorite in the rocks, but caused it to not fair so well in the desert where its sheer size and weight affected performance, steering and suspension. If you are looking for a rock-specific tire, the Roctane XD is hard to beat. 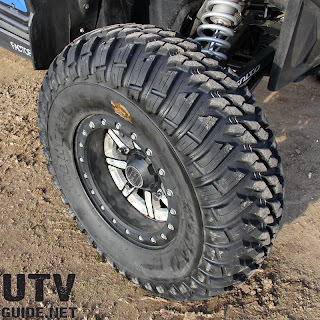 To fit a 30″ tire on a RZR XP, a little fender trimming is necessary up front. The stock front fender flare is still used, but the rear part needs to be moved back and the plastic underneath needs to be trimmed. Then you can use a self-tapping screw to fasten the fender flare to the tube behind it. This pulls the flare backwards and gives it just enough clearance for most situations. The only time we slightly hit was on the short course, over a jump with the STI Roctane XDs. A 30-inch tire will definitely affect how your UTV performs. A change in weight and spring(s) will help bring the RPMs back in line with the powerband of the engine. 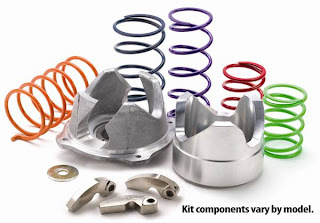 We used a kit from EPI Performance on our RZR XP and it made a big difference.